There are three different versions of this cream in the Aqua line: Fresh Watery Cream for oily skin, Moisture Watery Cream for dry skin, and this one: Combination Watery Cream for combination skin. 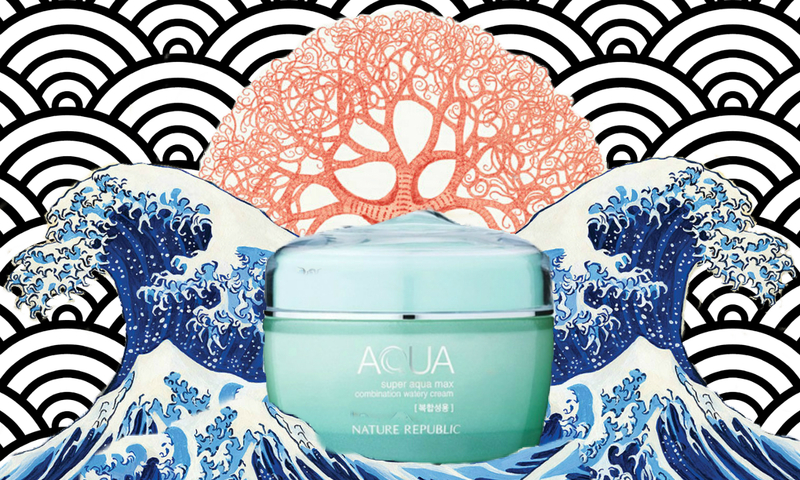 Each cream has basic moisturizers in it, laced with TONS of marine-sourced extracts, and a lot of silicons to bind the moisture barrier of the skin. I bought mine from Korea Depart with a bunch of other products and shelled out a ton of money for faster shipping (7 days to the US). Even though this product cost me probably around $20 (including shipping), I thought it was worth it because Nature Republic is definitely pretty generous with the amount of product you get in the container. The jar contains around 80ml – or around 2.7 oz. As you can see in the ingredients, there are a TON of marine-sourced extracts. And very few acne-triggering irritants. This ingredient list is what won me over initially. But as I thought about it more, I began to think, what are all these extracts good for? 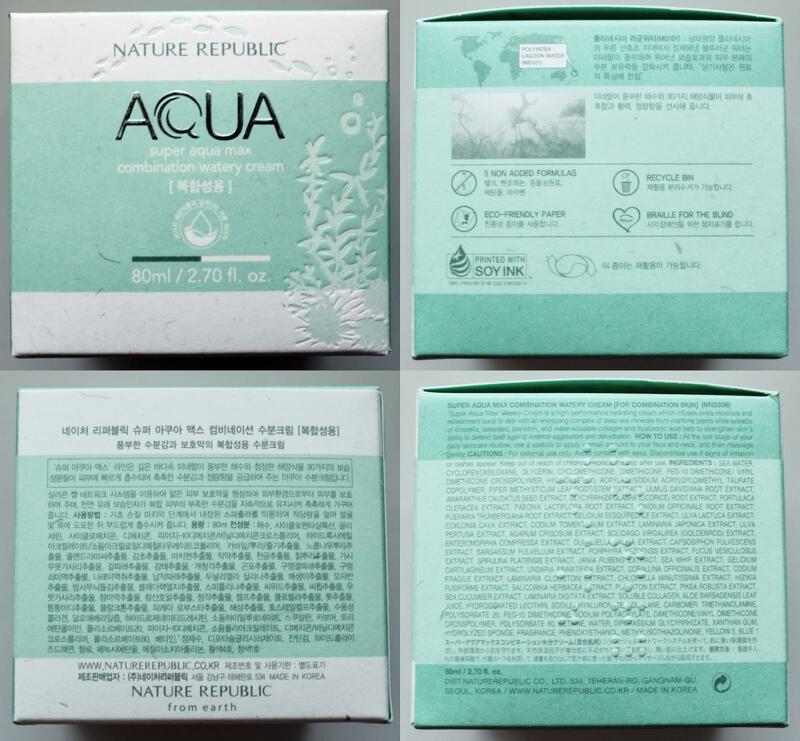 When I first read this list, I guess I was hoping that there would be a lot of vitamins and marine-based collagen based on all the extracts listed, but Nature Republic’s website states that these ingredients supply essential minerals such as sodium, potassium, and magnesium. Which is fine, I guess, but I certainly want more in a moisturizer. The first ingredient is sea water, and it’s strange, but I could definitely feel the salt in the sea water on my skin and it was not very pleasant. Maybe it’s just my imagination, but I definitely felt like there was a lot of sodium in this moisturizer, and it actually dried out my skin and made my skin feel a little dirty. Like swimming in the ocean but then not even showering off after. This product is definitely not moisturizing enough for people with combination skin. I would only recommend this product for people with extremely oily skin, but I would also be worried that the sea water would dry out their skin more to then create more oil. It did a good job of diminishing my pores and smoothing out my face like a primer, but that’s the only good thing about this cream. I saved the worst part for last: this moisturizer REEKS. It has this insanely strong cheap male cologne smell to it. And the smell would not dissipate! I kept smelling it all day long, and it drove me up the wall. I thought that I recognized the smell and sure enough, as I rummaged and smelled my boyfriend’s products, I found his Axe deodorant that smells identical to this cream! Not pleasant in a moisturizer. And I also thought, how bad do the ingredients smell if they need to mask it with such a heavy fragrance? I felt dirty all day long. I used this product for a week hoping I’d get used to the smell, but the smell kept bugging me. By day three I was shuddering whenever I opened the jar and smelled the product. By day seven I caught myself shuddering and saying “eeeewwww….” as I spread the moisturizer on my face. I finally asked myself “why am I doing this to myself?” and decided to stop using the moisturizer after a week. So if you want your skin to feel like you came out of the ocean and showered off by spraying Axe deodorant on your face, then by all means, this moisturizer is for you!